The show is sponsored by Chapel Hill United Methodist Church in Sodus to raise money for missions around the world. Publicity Chairwoman Sandy Harner said more than $705,725 has been raised over the decades. There are many volunteers who work throughout the year to produce the show. Church volunteers line up all the exhibitors and make sure the fairgrounds are ready. They do everything from running errands to cleaning tables. The idea for the show came after an elderly church member said she thought the church could do more for missions. The show was at the church for a few years before moving to Eau Claire High School. It moved to the fairgrounds in 1993. The juried Chapel Hill Arts & Crafts Show of 280 exhibitors is sponsored by Chapel Hill United Methodist Church in Sodus. 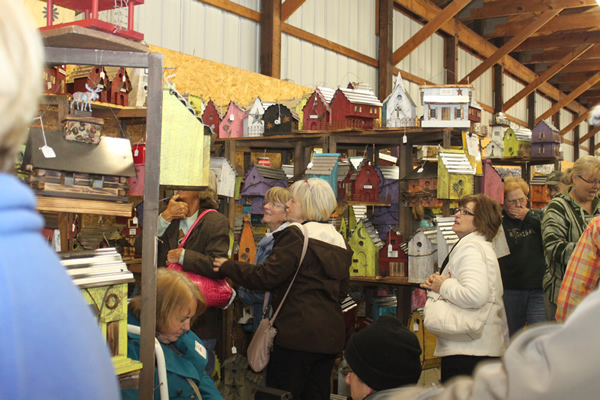 Known for its high quality, this show maintains its reputation as “best” craft show in the area, filling four commercial buildings at the Fairgrounds. Also included is an outdoor vendor/ farmers’ market, plus an indoor lunch area where you can purchase homemade baked goods, food, drinks, and snacks. Ample parking for this one-day event. Show profits go to support Mission Projects. BERRIEN SPRINGS – People can get a head start on holiday shopping and help a good cause at Saturday’s 40th annual Chapel Hill Arts & Crafts Show at the Berrien County fairgrounds. People can see items offered by more than 280 exhibitors in and out of the four commercial buildings from 8 a.m. to 4 p.m. There is a $3 entry fee, but no charge for parking. People can use either Gate 2 off M-139 or Gate 3 off Shawnee Road.